Did you know that the best way to get rid of acne is by using ice? The technique known as ‘skin icing’ is routinely performed by Korean women and several other cultures. It simply and very literally involves applying ice to one’s skin. How Icing the Skin Really Works? Cold temperatures improve circulation in the skin. It worked very well to decongest and help clear up your skin from dirt and oil. Icing your skin is also helpful with any inflammation on the skin surface, helping to reduce the swelling and redness that follows especially with acne, as icing in itself is anti-bacterial. Skin icing improves the blood circulation, giving your face a natural, fresh glow. Skin icing is also very beneficial if you have problems with blemishes, pimples, redness and skin inflammation. You can treat acne as well by applying ice cubes directly on them. Just place an ice cube and hold it for a few seconds until the skin gets numb. Repeat the process every other day, before you go to bed. If you have a problem with dark circles under the eyes you can use a mixture of frozen water with cucumber juice to eliminate them. Dark circles can be caused by a number of reasons, but whatever the reason, this technique will help you eliminate the puffiness. Skin icing is a cheap skin toner and works great when applied before makeup. It minimizes the pores underneath the makeup, and the foundation looks smooth and flawless. Whenever you’re in a hurry and don’t have the time to apply makeup, skin icing can give just what you need to refresh your look. Wrap some ice cubes in a cloth and run them over your face. It’ll make your skin radiant and fresh and natural. 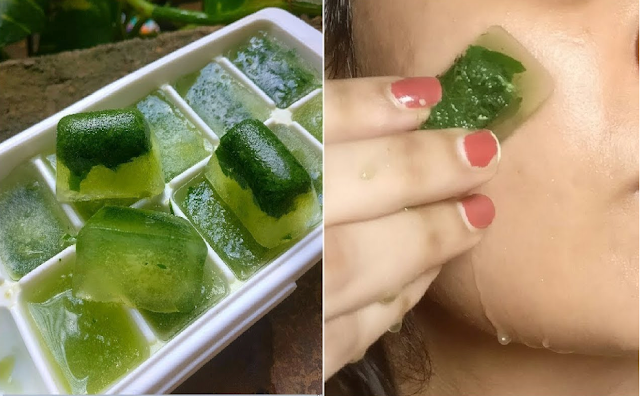 - You don’t always have to use a cloth when you apply the ice cubes but it’s recommended that you use gloves so that the cubes won’t melt right away. - Extreme cold can damage the small capillaries under the skin, so don’t use the ice cubes right out of the freezer. Wait a minute or two before applying them on your face. - Whenever you feel like you can’t take the cold anymore, stop with the icing. Don’t keep them on your face for more than 15 minutes.